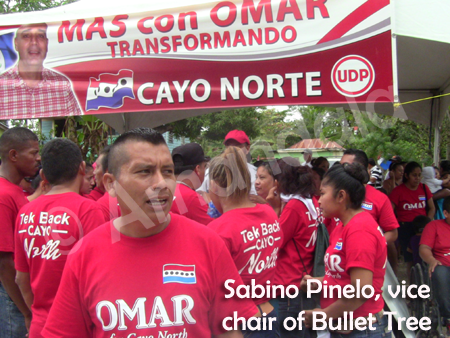 BELIZE CITY–Alberto August, chairman of the ruling United Democratic Party (UDP), has denied allegations by Opposition Leader Francis Fonseca that the UDP dipped deep into the public coffers to finance its campaign for the Cayo North by-election held two days ago. August would not disclose how much was spent on the UDP’s campaign, and he told us that allegations that they spent upwards of $800,000—we suggested a million dollars—are untrue. “As I said earlier, there is cause for concern when it comes to the use of public funds in election campaigns and people will say, ‘Scorch on both your houses,’ but I think that as a country we have to get beyond that,” he said, at a press conference held at his party’s headquarters in Belize City Tuesday. “I see public funds being used for election purposes in an unprecedented way today in Belize. I don’t think it bodes well for politics. I don’t think it bodes well for democracy, for the development of our country,” Fonseca expressed. “If the outcome of elections can be determined by the amount of money spent on the political campaign, then special interest donors have greater power to influence elections than the average voter. Such a situation unjustly violates the principle of equality that is fundamental to democratic government,” says the article, “The Power of Money: The Ethics of Campaign Finance Reform”, published by Santa Clara University in California, USA. Fonseca underscored that the Belizean people will have to show that they care about the issue – that they want change. “They can’t just sit back and say, ‘As long as I get a little piece of the change it’s all right with me. I don’t care where the money is coming from and who accounts for it…’ And some are of the view that that seems to be the attitude of many today, so I hope that’s not the case and I think that we can have that type of dialogue on that very important national issue…” Fonseca commented. Fonseca went on to remark, “…there seems to be no line, in my view, between the public treasury and the United Democratic Party treasury. There seems to be no line. Election campaigns are run with public funds completely. On Election Day people are getting letters for scholarships, people di get land papers. August said that those allegations levied by Fonseca “carry no weight.” He told us that the PUP has made a series of untrue allegations, including allegations that he was attempting to take official binders with the data of voters to his home. On Monday, the PUP’s Cayo Central standard bearer, Dan Silva, told Amandala that campaign finance reform is badly needed. “There is a lot of money out here today. It is a sea of red,” Silva said. “They have put their sticky hands in the people’s cookie jar…” to work against the people, the PUP candidate in the elections, Richard Harrison, claimed and that, he said, is what the people of Cayo North would have voted against. It turned out, though, that Cayo voters sent no such message, as 66.4% of them voted in favor of the UDP candidate. Many others in the Opposition with whom we spoke on Monday, including Harrison, alleged that the Barrow administration had been channeling public funds into the area to buy the elections. “Nothing could be further from the truth,” August said. He told us that Prime Minister and Minister of Finance Hon. Dean Barrow would not have approved of any such request. He added that the only public funds being used are for infrastructural works to the benefit of the people and not to pay for campaign banners. He said that after Omar Figueroa won the party’s divisional convention in February 2014, when he became the standard bearer, they began to work to secure campaign financing for the division. “The business community saw him as a viable candidate,” August said. “The reality is, there is no incentive when you are in government to do it,” he commented. He said that apart from getting both parties, the governing and opposition parties, to understand the importance of the reform, the drive for it will also have to come from the Belizean people. “As I said, it has to be a bipartisan approach to these matters. We will have to stand together and work on this issue together because, you know, the reality is we are in a sense where the UDP was ten years ago or so,” Fonseca said. While there was much said about the need for campaign financing reform, Fonseca also spoke of the need for voters to have unimpeded access to polling stations. A throng of UDP supporters and members amassed at the 100-yard line for the polling station in San Ignacio, while a smaller mass of Opposition members and supporters stood a distance off. Fonseca said that this “very thick wall of red and smaller wall of blue on the other side” was a concern. “We have to always remember that voting is for the people. They come to vote. The voting area must be sacred. We can’t ignore those rules. That was certainly very glaring. People had to be walking through walls of campaigners to get to vote,” Fonseca pointed out. He added that “that is something we have to register and record,” and urged the Elections and Boundaries Commission to look at the issue so that people can vote without any fear of intimidation. We also raised the issue of negative campaigning after having received reports that some of Harrison’s campaigners were bad-mouthing the UDP candidate when they did their ground work in San Ignacio, as well as making slanderous Facebook comments about the UDP’s candidate. Fonseca said that he personally knows Omar Figueroa, whom he described as “a decent man and good man,” additionally noting that Figueroa’s wife is a friend of his (Fonseca’s) family. He said that he, personally, “would not countenance or support any such attack” on Figueroa. “The campaign should be about ideas and solutions to issues that people face in their communities,” Fonseca urged.